Hope came in the form of World War I. Congress authorized the construction of the Wilson dam on the Tennessee River to power an ammunition factory. But the war ended shortly after the project was completed. Henry Ford declared he would invest millions of dollars, employ one million men, and build a city 75 miles long in the region if the government would only give him the whole complex for $5 million. Though taxpayers had already sunk more than $40 million into the project, President Harding and Congress, believing the government should not be in the business of economic development, were inclined to accept. George Norris, a progressive senator, attacked the deal and proposed instead that it become a public power utility. Though he was from Nebraska, he was on the agriculture committee and regularly visited the Tennessee Valley. Staying in the unlit shacks of its poor residents, he became sympathetic to their situation. Knowing that Ford was looking to produce electricity and fertilizer that were profitable, not cheap, Norris believed Ford would behave as a monopolist. If approved, Norris warned, the project would be the worst real estate deal “since Adam and Eve lost title to the Garden of Eden.” Three years later Norris had defeated Ford in the realms of public opinion and in Congress. Over the next 10 years, Norris mobilized the progressive movement to support his sweeping vision of agricultural modernization by the federal government. 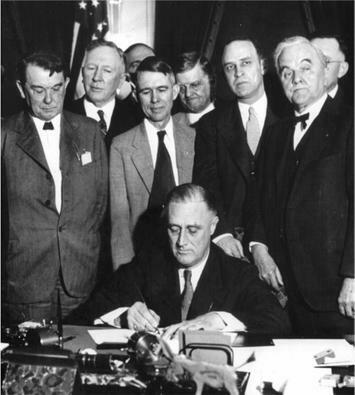 In 1933 Congress and President Roosevelt authorized the creation of the Tennessee Valley Authority. It mobilized thousands of unemployed men to build hydroelectric dams, produce fertilizer, and lay down irrigation systems. Sensitive to local knowledge, government workers acted as community organizers, empowering local farmers to lead the efforts to improve agricultural techniques and plant trees. Just a decade later, as Vietnam descended into quagmire, left-leaning intellectuals started denouncing TVA-type projects as part of the American neocolonial war machine. The TVA’s fertilizer factories had previously produced ammunition; its nuclear power stations came from bomb making. The TVA wasn’t ploughshares from swords, it was a sword in a new scabbard. In her 1962 book Silent Spring, Rachel Carson described modern agriculture as a war on nature. The World Bank, USAID, and even the Peace Corps with its TVA-type efforts were, in the writings of Noam Chomsky, mere fig leaves for an imperialistic resource grab. Where Marx and Marxists had long viewed industrial capitalism, however terrible, as an improvement over agrarian feudalism, the New Left embraced a more romantic view. Before the arrival of “progress” and “development,” they argued, small farmers lived in harmony with their surroundings. In his 1973 book, Small is Beautiful, economist E.F. Schumacher dismissed the soil erosion caused by peasant farmers as “trifling in comparison with the devastations caused by gigantic groups motivated by greed, envy, and the lust for power.” Anthropologists like Yale University’s James Scott narrated irrigation, road-building, and electrification efforts as sinister, Foucauldian impositions of modernity on local innocents. By the time of the United Nations Rio environment conference in 1992, the model for “sustainable development” was of small co-ops in the Amazon forest where peasant farmers and Indians would pick nuts and berries to sell to Ben and Jerry’s for their “Rainforest Crunch” flavor. A year later, in Earth in the Balance, Al Gore wrote, “Power grids themselves are no longer necessarily desirable.” Citing Schumacher, he suggested they might even be “inappropriate” for the Third World. Over the next 20 years environmental groups constructed economic analyses and models purporting to show that expensive intermittent renewables like solar panels and biomass-burners were in fact cheaper than grid electricity. The catch, of course, was that they were cheaper because they didn’t actually deliver much electricity. Greenpeace and WWF hired educated and upper-middle class professionals in Rio de Janeiro and Johannesburg to explain why their countrymen did not need new power plants but could just be more efficient instead. And so the Left went from viewing cheap energy as a fundamental human right and key to environmental restoration to a threat to the planet and harmful to the poor. In the name of “appropriate technology” the revamped Left rejected cheap fertilizers and energy. In the name of democracy it now offers the global poor not what they want — cheap electricity — but more of what they don’t want, namely intermittent and expensive power. At the heart of this reversal was the Left’s growing suspicion of both centralized energy and centralized government. Libertarian conservatives have long concocted elaborate counterfactuals to suggest that the TVA and other public electrification efforts actually slowed the expansion of access to electricity. By the early 1980s, progressives were making the same claim. In 1984, William Chandler of the WorldWatch Institute would publish the “The Myth of the TVA,” which claimed that 50 years of public investment had never provided any development benefit whatsoever. In fact, a new analysis by economists at Stanford and Berkeley, Patrick Klein and Enrico Moretti, find that the "TVA boosted national manufacturing productivity by roughly 0.3 percent and that the dollar value of these productivity gains exceeded the program's cost." Even so, today's progressives signal their sophistication by dismissing statist solutions. Environmentalists demand that we make carbon-based energy more expensive, in order to "harness market forces" to cut greenhouse gas emissions. Global development agencies increasingly reject state-sponsored projects to build dams and large power plants in favor of offering financing to private firms promising to bring solar panels and low-power "microgrids" to the global poor — solutions that might help run a few light bulbs and power cell phones but offer the poor no path to the kinds of high-energy lifestyles Western environmentalists take for granted. Where senators Norris and Gore Sr. understood that only the government could guarantee cheap energy and fertilizers for poor farmers, environmental leaders today seek policy solutions that give an outsized role to investment banks and private utilities. If the great leap backward was from statist progressivism to anarcho-primitivism, it was but a short step sideways to green neoliberalism. But if developed-world progressives, comfortably ensconced in their own modernity, today reject the old progressive vision of cheap, abundant, grid electricity for everyone, progressive modernizers in the developing world are under no such illusion. Whether socialists, state capitalists, or, mostly, some combination of the two, developing world leaders like Brazil’s Lula da Silva understand that cheap grid electricity is good for people and good for the environment. That modern energy and fertilizers increase crop yields and allow forests to grow back. That energy poverty causes more harm to the poor than global warming. They view cheap energy as a public good and a human right, and they are well on their way to providing electricity to every one of their citizens. The TVA and all modernization efforts bring side effects along with progress. Building dams requires evicting people from their land and putting ecosystems underwater. Burning coal saves trees but causes air pollution and global warming. Fracking for gas prevents coal burning but it can pollute the water. Nuclear energy produces not emissions but toxic waste and can result in major industrial accidents. Nevertheless, these are problems that must be dealt with through more modernization and progress, not less. Viewed through this lens, climate change is a reason to accelerate rather than slow energy transitions. The 1.3 billion who lack electricity should get it. It will dramatically improve their lives, reduce deforestation, and make them more resilient to climate impacts. The rest of us should move to cleaner sources of energy — from coal to natural gas, from natural gas to nuclear and renewables, and from gasoline to electric cars — as quickly as we can. This is not a low-energy program, it is a high-energy one. Any effort worthy of being called progressive, liberal, or environmental, must embrace a high-energy planet. Submitted by Angelinalee on Thu, 06/19/2014 - 01:39. Submitted by Geography student on Wed, 07/03/2013 - 15:59. While this article makes some good points, and I strongly support more power for the poor. However, the article should cover the cost/benefit analysis in much more detail. For example, beneficiaries of dams whether for irrigation water or electricity seldom pay the actual real cost of the project. If the dam or other project has to be subsidized by those other than the users is it really a good investment? Also as an area becomes more remote the cheaper it is to put in, for example, solar power than to run a heavily subsidized power line to the area. If there is a problem with global warming gases then they should be taxed where they are produced, and the money spent on cost effective research to produce cheap energy while not producing global warming gases. As far as the cost effectiveness of the TVA, why is it still in existence? If cost effective why couldn't the various parts be shown to be cost effective compared to private industry, or privatized? A huge problem with well meaning and beneficial government programs is that they don't go bankrupt if they are badly managed or fall behind the times, but can just cost the taxpayer more money. A good balance between taxpayer investment benefits must be found. Submitted by rtreep on Sat, 06/29/2013 - 21:49. This is a great article about neoliberal values being appropriated by the state, putting progressives into opposition against the very vision they themselves created. Energy is tied to prosperity. Cheap energy, however, is not a natural human right in any document. Perhaps a case could be made for a human right to equal energy opportunity, but cheap energy? The price of energy today does not match its true cost, when including the economic impact to the environment. Clumsy ways of factoring this in, like the carbon tax, are being tried. The problem is one of equitable distribution, and saving some of the environment for future generations. The author convincingly showed how the state was probably the only entity large enough to sponsor a very large project like the TVA, and it did provide genuine human development. Neoliberals who dispute this are no better than neoconservatives trying to revise history. What is more important, however, is that the author shows how the intellectual left is impoverished in its arguments against the state, falling into Marxist-style worker-production cant. Today's urban unrest is about something different that is emerging in response to globalism. Progressives have little currency with the protesters. Something new is happening. Submitted by dankingbooks on Sat, 06/29/2013 - 11:46.